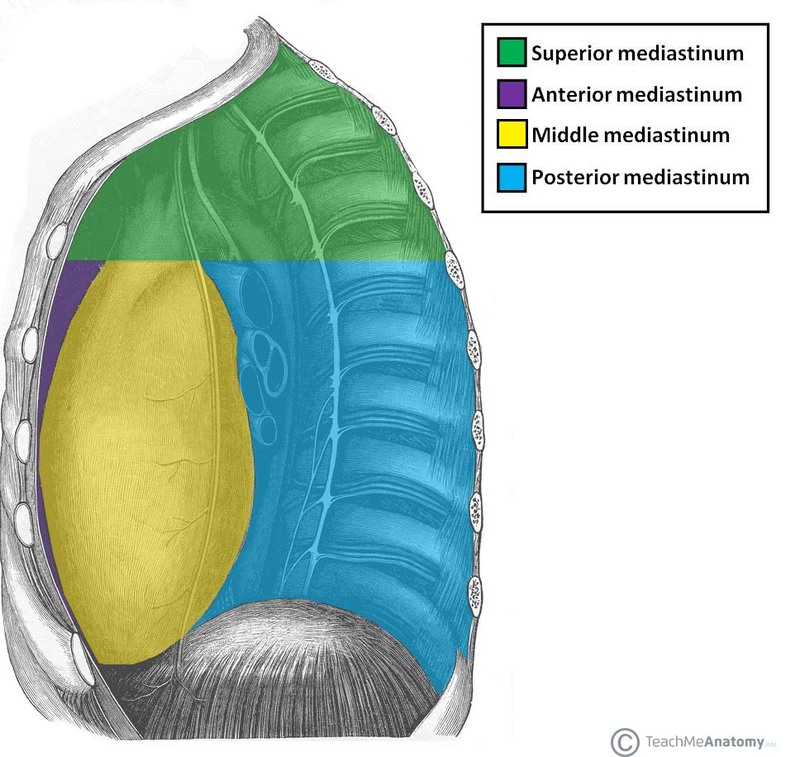 In this article, we shall look at the anatomy of the middle mediastinum – its borders, contents and clinical correlations. Anterior: Anterior margin of the pericardium. Posterior: Posterior border of the pericardium. Laterally: Mediastinal pleura of the lungs. Superiorly: Imaginary line extending between the sternal angle (the angle formed by the junction of the sternal body and manubrium) and the T4 vertebrae. Inferiorly: Superior surface of the diaphragm. Fig 1.0 – The mediastina of the thorax. The middle mediastinum is the largest subdivision of the inferior mediastinum. 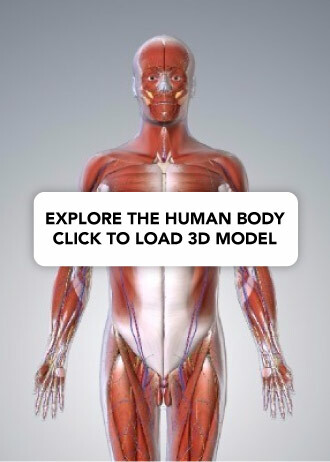 It contains several important organs, vessels, nerves and lymphatic structures. The middle mediastinum contains the heart, and its protective sheath, the pericardium. It also contains the tracheal bifurcation and the left and right main bronchi. Ascending aorta – the first part of the aorta, which arises from the aortic orifice. It moves upwards, exiting the fibrous pericardium and entering the superior mediastinum – where it then becomes the aortic arch. The ascending aorta gives rise to two branches; the left and right coronary arteries. 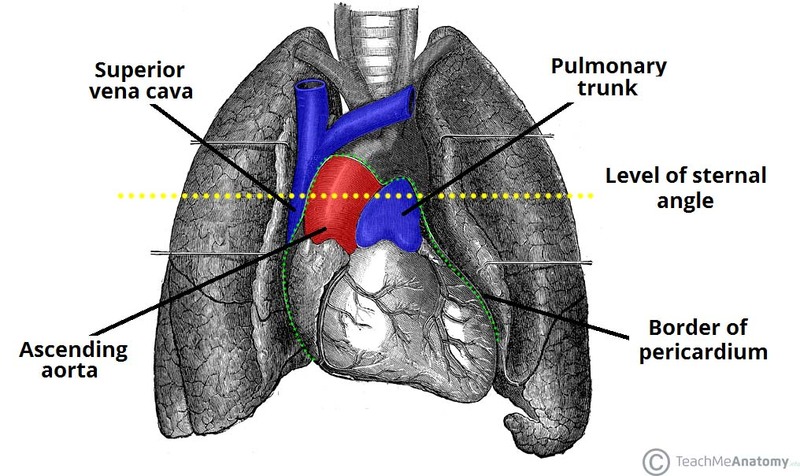 Pulmonary trunk – gives rise to the left and right pulmonary arteries. The trunk itself is relatively short and wide, allowing a large volume of blood to pass through it. Superior vena cava – returns deoxygenated blood from the upper half of the body. It is formed by the right and left brachiocephalic veins. Fig 1.1 – The great vessels of the middle mediastinum. Note how only the origins of the vessels are contained within the middle mediastinum. 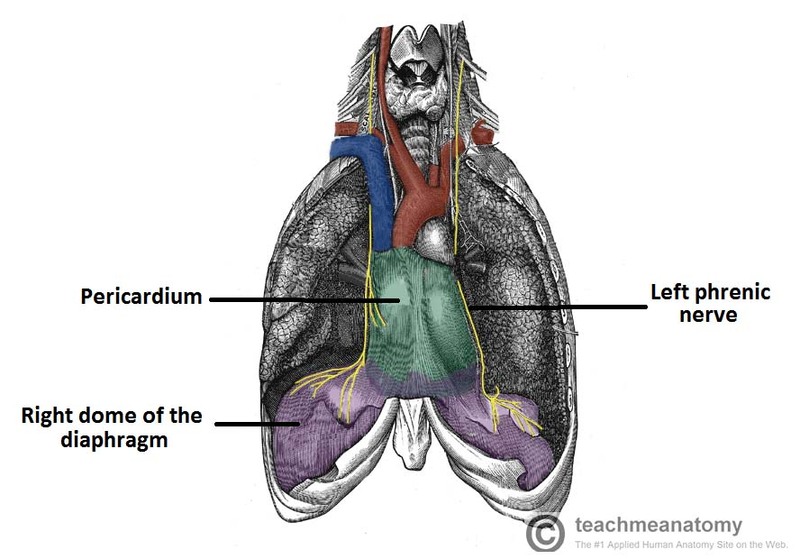 The cardiac plexus and the phrenic nerves are both located within the middle mediastinum. Cardiac plexus – a network of nerves located at the base of the heart, containing sympathetic and parasympathetic fibres. The sympathetic nerves are derived from the T1-T4 segments of the spinal cord, and the parasympathetic innervation is supplied by the vagus nerve. The plexus can be subdivided into superficial and deep components. Phrenic nerves (left and right) – mixed nerves that provides motor innervation to the diaphragm. They arise in the neck, and descend through the middle mediastinum to reach the diaphragm. Fig 1.2 – The anatomical course of the phrenic nerves, which passes through the middle mediastinum to innervate the diaphragm. The tracheobronchial lymph nodes are located within the middle mediastinum. They are a group of nodes associated with the trachea and bronchi of the respiratory tract – and are characteristically enlarged in certain lung pathologies. They form from the gathering of bronchial nodes within the hila of the lungs. Individual groups of nodes are connected via fine lymphatic channels. The sternal angle is formed by the junction of which two bones? Which muscle forms the inferior border of the middle mediastinum? Which of the great vessels of the heart gives rise to the coronary arteries?